Andrew Shinn has warned Horncastle Town that they cannot afford to take their foot off the gas when they face basement side Brigg Town Development on Saturday. The Wongers returned to the top of the Balcan Lighting Lincolnshire League last weekend, edging past Ruston Sports on goal difference following their 2-0 win at Sleaford Sports Amateurs. 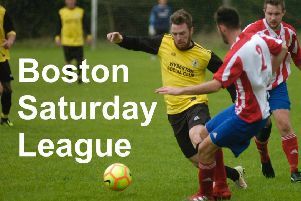 Town may struggle to hold on to top spot as the resignation of AFC Boston from the division means they look set to be deducted the six points they claimed from their opponents, while Rustons would be deducted just one. But as Horncastle prepare for a hectic March which involves back-to-back clashes with defending champions Skegness Town and two cup semi-finals against Wyberton, the manager says his squad need to be at their best. “We can’t afford to take our foot off the gas,” he told The News. “We didn’t play our best game against Sleaford and we need to be better for the run-in we’ve got. “I think we have to do well against Brigg to give us something to build on. “We can’t afford to go into March with any negatives. Once again, the Wongers bosses are keen to build from the back as they challenge their squad to keep their fourth clean sheet from five matches, a late consolation from Grimsby Borough being the only time they have conceded since January 13. “We want another clean sheet. That’s what we’re looking for,” Shinn added. Town are hoping to welcome back defender Stephen Brown to the squad following his hamstring injury. The Zebras sit bottom of the table with just one win and two draws from 15 matches. Kick off at The Wong will be at 2pm.